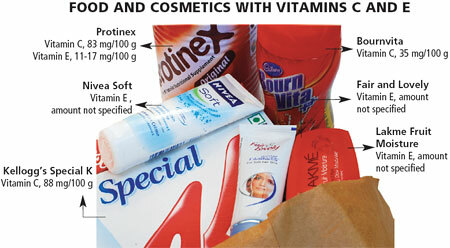 ANTIOXIDANTS are a part of health food products like Kellogg’s cornflakes, Protinex and Horlicks. But claims of these being healthy and nutritious are likely to fall flat as antioxidants have been found to have adverse health reactions. A research has shown that antioxidants like vitamins C and E could be harmful to women planning to have a baby. The two vitamins were studied by biologists from Weizmann Institute of Science in Israel. Both these vitamins are promoted as elixirs for youth—they keep wrinkles at bay by neutralising the action of reactive oxygen produced in the body in response to variables like pollutants and stress. The researchers found that these antioxidants reduce ovulation. This happens because the process of ovulation requires free radicals. Free radicals are produced by the cells, such as macrophages and neutrophils, which are recruited to the ovary during the initiation of the ovulation process. Macrophages and neutrophils are also produced during inflammation. As vitamins are known to reduce inflammation, the team wanted to find whether the vitamins would also affect ovulation. They conducted experiments on mice and on isolated follicles from the ovary. They used hormones to induce ovulation in mice and then injected vitamins in the sac around the ovary. The vitamins reduced the rate of ovulation as they prevented production of the luteinising hormone necessary for the process. Studies on the cultured follicles showed the expression of genes involved in ovulation was also impaired when they were exposed to antioxidants— these are the same genes involved in inflammation. Nava Dekel, the lead author, noted the findings could prove useful to women having trouble getting pregnant. The understanding might also show that certain antioxidants could be an effective means of birth control and replace the prevalent hormone-based methods, the researchers contend in their paper published in the January 25 issue of PNAS. What makes the study paradoxical is that antioxidants are prescribed by fertility experts world over. Antioxidants are used as pro-fertility agents in many medicines, said Abha Majumdar, infertility expert at Sir Ganga Ram Hospital in New Delhi. She pointed out that the main drawback of the study was that it was not carried on humans but accepted the study has some substance. “High doses could affect ovulation and lower fertility. Further research must be done to see if normal levels of the vitamins would interfere in the process,” she said. This would be significant as fruits and vegetables have vitamins C and E, though in lower amounts, and eating them would not compare with having a 400 mg vitamin E capsule. “It is a matter of degree, as everything in life and biology is. Not too much, not too little,” said Frank Comhaire, antioxidant expert and a professor at the Ghent University in Belgium. “The antioxidants must be given in correct dose and combinations exactly in the same way as is the case for any medication,” he added. The rule should be not to exceed the recommended daily dose of vitamins and minerals and to use only “natural” vitamins present in fruits and vegetables, he suggested. The Weizman team is yet to study the effect of the antioxidants on fertility when they are part of the diet. Oral consumption of antioxidants has also been linked to increased fertility in men. Experts with Cochrane Collaboration, which prepares healthcare database, reviewed the evidence linking fertility in men and use of antioxidants. They found that around 80 per cent of male subfertility cases could be due to the damaging effects of oxidative stress on sperms. Consuming antioxidants reduced damage to sperms. None of the studies included in the review showed any adverse effects of the antioxidants on men similar to that seen in women. But, I thought omega 3 and 6 fatty acids rich in anti oxidants were highly recommended for women with ovarian problems. Take the case of flax seeds, they have been highly recommended over the years for their phyto estrogen qualities which inturn help women ovulate. Many a time contradicting studies providing information which debunks the prior, leaves a consumer like me confused.. The research merely flags the potential risks of uncontrolled consumption of vitamin supplements. Vitamins present in natural food are not likely to harm. A well balanced diet is the best.